It is symphony time once again for the fetching Mrs. B and I as we go to Jones Hall on Saturday night to hear our great young, dynamic Maestro Andres Orozco-Estrada lead our world class Houston Symphony Orchestra in a program with three pieces of completely different moods, with the connection that they all were composed in the 20th century. Two of the pieces are by the Russian [Soviet] composer of the twentieth century, Dmitri Shostakovich, his concert overture called the Festival Overture and his Symphony #10. The middle piece is by the French Romantic/Impressionist composer Maurice Ravel, his Piano Concerto for the left hand. While two of the pieces are by Dmitri Shostakovich they have completely different moods. The Festival Overture is a celebratory happy energetic piece, while his Symphony #10 is an intense, pensive, and dramatic work. 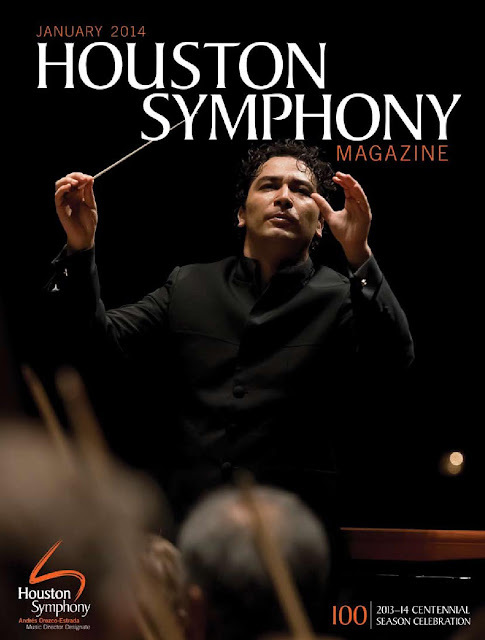 From the Houston Symphony Orchestra website, they describe the two pieces as thus: "This program of 20th century classics kicks off with one of Shostakovich’s brightest and most joyful works, his Festive Overture." "Shostakovich’s deeply personal Symphony No. 10 was written in the wake of Stalin’s death. It contains a biting caricature of the Soviet dictator and ends with a thrilling and emotionally intense finale." The middle piece by Maurice Ravel is his Piano Concerto for the left hand in D-Major and it is described in the HSO website as thus: "...marvel at Ravel’s Piano Concerto for the Left Hand, performed by Houston favorite Kirill Gerstein. Inspired by pianist Paul Wittgenstein, a WWI amputee, Ravel’s astonishing and moving score creates the illusion of two hands playing while using only one." Ravel composed an unusual structure in this concerto as he scores it in one movement with a slow-fast-slow tempo instead of the usual classical structure of three movements with usually the first movement fast, the second slow, and the third fast. As always, whenever the fetching Sheralyn and I attend a Houston Symphony Orchestra concert, I like to share just a little from the pieces that we will be hearing tonight [Saturday]. The beauty of the space and food get 5 juicy stars. The Venues in San Francisco were built with class! I'm no critic, but this place makes you appreciate design and aesthetics. I went to two events here. Both times, I had a great experience.